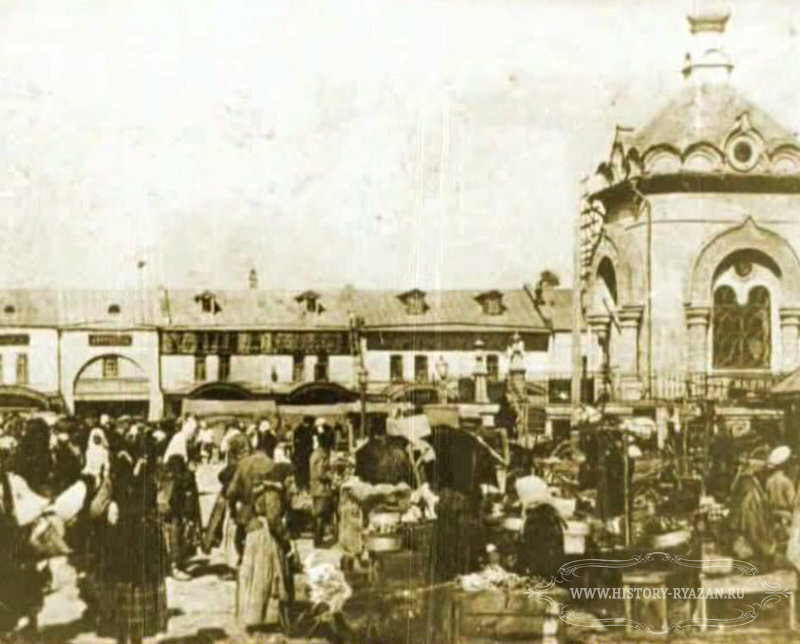 This is Chapter 5 of the thread “The World of Jews in Ryazan: Beyond the Pale.” Other chapters can be found here. “It is an odd feeling to correspond with people whose relatives knew yours 150 years ago.” – Laurie Williamson, a friend doing Civil War research, after discovering some one whose ancestor was in the same Civil war brigade as her great-grandfather. Leon Kull, great-grandson of Yakov Kull, grew up in Moscow, Russia. In 1990, Leon emigrated to Israel with his wife and kids. I grew up 6000 miles away in Sudbury, Massachusetts, a little town outside of Boston. My Jewish grandfather, Boris (Bornett) Bobroff, had lived in Wisconsin, but died before I was born. 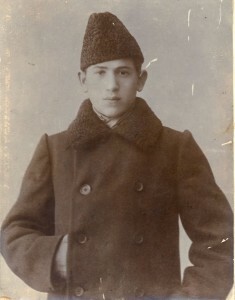 I “met” Leon Kull through the Ryazan subgroup within JewishGen.org as I set forth on an expedition to learn more about my grandfather. 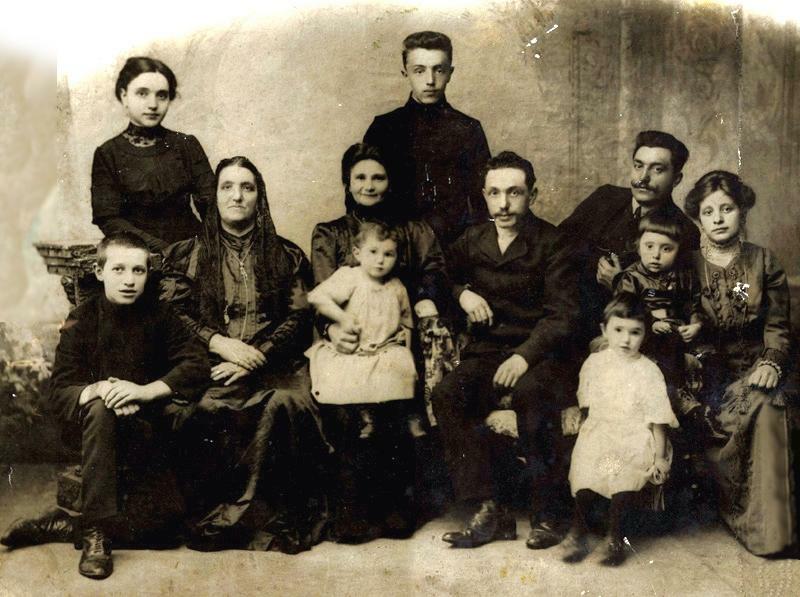 Members of this JewishGen geneology subgroup all have ancestors who lived in Ryazan, Russia, at some point in the 19th or early 20th centuries. Because Jews were only 2-3% of Ryazan’s population, the JewishGen Ryazan subgroup is tiny, about nine people. It was easy to email them. Several responded to me, including Leon Kull. I began to learn bits of how their Ryazan ancestors had wound up living in a place from which most Jews were excluded by the laws of the Russian Empire. Kull family in Ryazan in 1910. Yakov is the adult male farthest right. His brother Ber is next to him. Last week, while I was researching my most recent post, Leon at his computer in Israel began emailing me information he was turning up in some files he hadn’t checked in a while. A number of years ago, Leon had hired an archival researcher in Russia who’d uncovered various pieces of information – including pages from the 1910 Russian Census listing Yakov Kull’s place of residence and work. 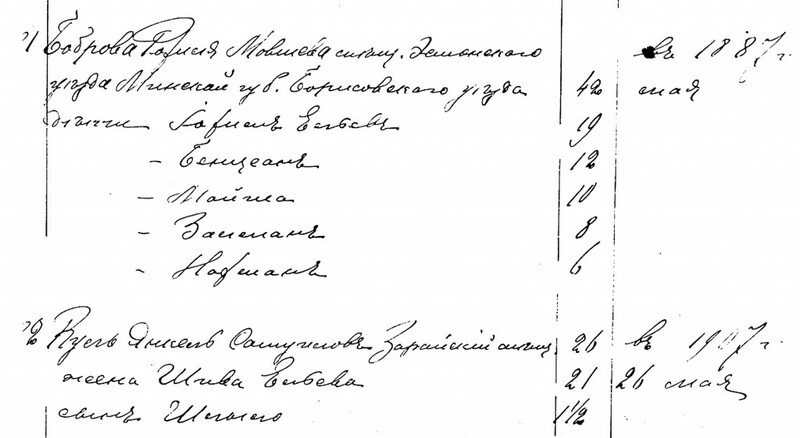 This Census showed that by 1910, Yakov had moved on from managing the clothing shop to working as a salesman at the Ryazan branch of the Russian Singer Sewing Machine Company. Bobrova Rokhilya Movsheva (daughter of Movsha), bourgeoise, born in 1867 in Minsk province (within the Pale of Jewish Settlement). 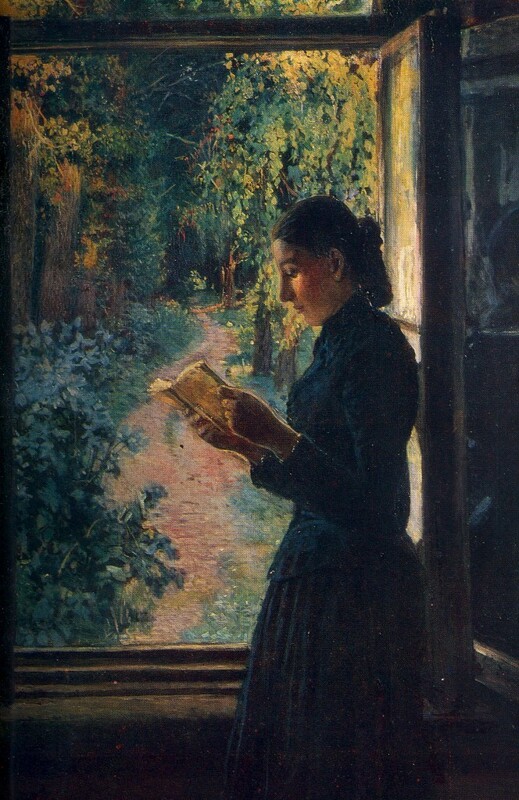 She settled in Ryazan in 1887. Rokhilya Bobrova’s husband was Elya Bobrov, born between 1860-65, died sometime before 1905. At the time of the 1910 Russian Census, Rokhilya Bobrova was 42 years old. My grandfather, Boris L. Bobrov (or Bobroff) had already left Russia by the time of the 1910 Census, so he would not have been included here even though he had lived in Ryazan. How was Rokhilya Bobrova related to my grandfather? She was about 16 years older than him. So she could have been a young aunt or an older cousin. (It’s unlikely that she was his very young mother, because his middle initial was “L,” meaning that his father’s first name began with that letter, so it was not Rokhilya’s husband Elya.) Perhaps in future I’ll track down the connection between Boris and Rokhilya by looking back at Minsk, from whence they came. I suppose the reason anyone searches for information about their ancestors is that they’re yearning to find connections with others beyond themselves in time and place. Early on, I had thought that Robin Pollack Wood and I might have such a time-warp connection, via her great-grandfather who owned an agricultural machinery factory in Ryazan, and my grandfather, who worked in one. But it turned out the two factories, though similar in name, were actually different. I had been silly, I thought, to expect such a coincidental connection within the Ryazan subgroup. So it was with eerie astonishment that, a day or two after Leon’s first finding Rokhilya Bobrova, I read a new email from him. This one had images attached: of a handwritten, double-spread page of the 1910 Russian Census for Ryazan. Listed on line #81 was Rokhilya Bobrova. On the very next next line, #82, was Yakov (Yankel) Kull! “Why,” wrote my fellow detective Leon rhetorically, did the two families appear right next to each other? For the answer, he turned my attention to the second half of the Census listing, which noted work place and residence. Happily, Leon provided me an English translation of the faded, scratchy, handwritten Russian. Wow! Leon and I might live 6000 miles apart, but a hundred years ago, our forebears lived in the same house. And they worked together at Singer’s. They must have known each other quite well. I felt like Leon’s and my ancestors were not only coming to life. Their ghosts were beginning to dance with each other! But what was the quintessentially American Singer Sewing Machine Company doing in Ryazan, on the endless Russian steppes? The Singer sewing machine was such a touchstone for 19th and 20th century Americans that when I mentioned Singer on my Sarah Lawrence College email list, it sparked a whole round of memories of our mothers sewing our clothes with the family machine. To me, envisioning Singer sewing machines in Russia felt like culture clash. An odd company for my Russian ancestor to be employed by! 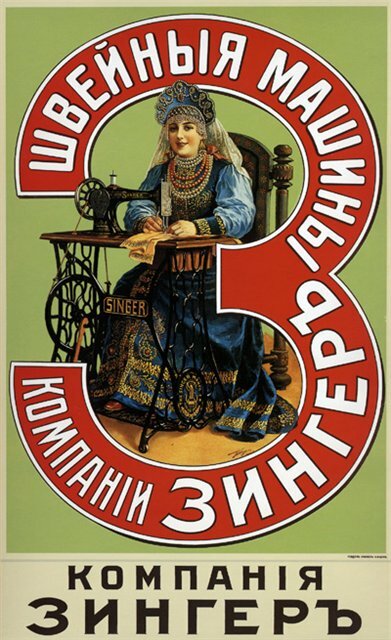 Another ad for Russian Singer sewing machines. 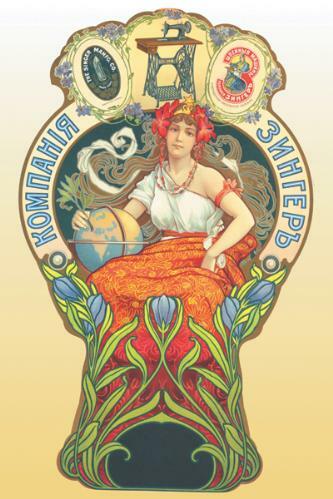 Note the Art Nouveau influence, then popular in Russian fashion as well. According to another source, Singer sewing machines had come to Russia well before this: “By the beginning of the 1880s the network of Singer’s sales offices, depots and stores had covered the empire. The aggregate number of branches was eighty-one.” Many of the machines were imported from the United States. In addition, in 1902, a large Singer factory, eventually employing 5000 workers, was built in Podolsk, in Moscow province. So exactly what kind of work did Kull and Bobrova do for Singer? Well, we have clues for Kull, because the Census listed him as “an agent for the sale of Singer sewing machines.” So Kull was part of the Singer sales force which Mona Domosh describes in her wonderful American Commodities in an Age of Empire: a vast, far-flung, highly organized army of Russian sales agents. 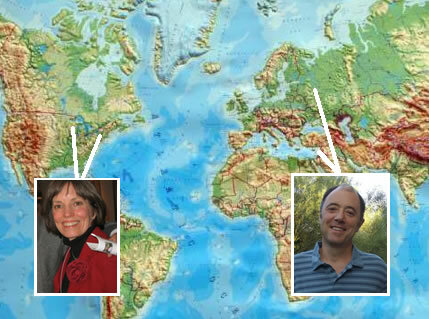 In Russia, with the largest territory of any nation on earth – three times the distance east to west as the United States – these agents sold more sewing machines than in anywhere else in the world besides the US. Sales in Russia went from almost 70,000 in 1895 to nearly ten times that in 1914. 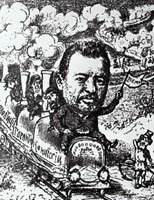 The agents traveled the Russian Empire via trains, wagons, and horseback. They floated cargoes of sewing machines thousands of miles down Siberian rivers. There, nomads buying sewing machines paid for them in cattle, pelts and fish (which the sales agents in turn sold for cash). Back in Ryazan, Kull’s work life was undoubtedly less adventuresome. But Singer’s local operations in Russia were so intricately organized that Kull likely had a job worthy of its own separate blog post. In fact, I’m finding so much almost palpable detail about Singer sales arrangements in Russia that I will postpone a fuller picture of Kull’s job to a later chapter. But what about Rokhilya Bobrova? What kind of work did she, a woman, do for Singer? We must remember that, by 1910, Bobrova had been a widow for something over five years. She had five children ranging in age from 6 to 19. A lot of mouths to feed. In addition, employees, especially in more responsible positions, “were recruited from ethnic minorities living in Russia, particularly ethnic Germans and Jews,” due at least in part to the lack of commercial experience among ethnic Russians. Thus it seems likely that Rokhilya Bobrova demonstrated sewing techniques or taught sewing classes at Singer’s. We can probably assume that Bobrova had originally received her permit to live outside the Pale due to her husband’s profession (I don’t know yet what it was, but hope to unearth it). But Jews had to renew their permits to live outside the Pale every five years, traveling all the way back to their place of origin to get the renewal. Bobrova’s permit came up for renewal in 1909. And now she was widowed. 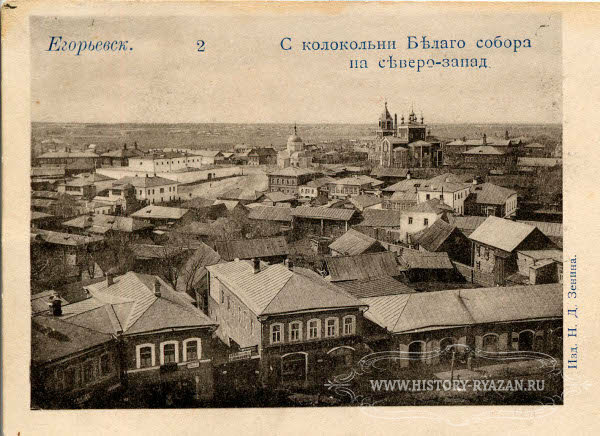 However, 1909 was the same year Singer apparently arrived in Ryazan. At that point, given Singer’s hiring tendencies, the fact that Bobrova was a Jewish woman may suddenly have become a huge asset. I wonder whether the local Singer store’s management – perhaps even Yakov Kull – played a role in enabling the now-widowed Bobrova to stay on living in Ryazan in her own right. This is Chapter 4 of my series The World of Jews in Ryazan: Beyond the Pale.” Earlier chapters can be found here. 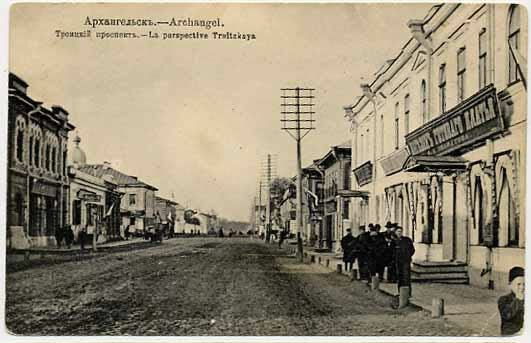 I had set myself the pleasant task this week of writing about the early 20th century clothing store in Ryazan, Russia, where Yakov Kull worked as a shop manager. What followed was a lot of detective work of the kind that gets me excited, but doesn’t always resolve all my questions. The answers get closer, but at the same time coquettishly move farther away, drawing me deeper in. For now I’ll present a “progress report” on the intriguing issues that have billowed up as I’ve searched for Yakov Kull and his brother Ber, who worked in the same shop. Maybe some one out there will read it and be able to part some of the mist surrounding this entire project on the world of Jews “Beyond the Pale” in Ryazan. Whether or not that happens, my search will continue for more stories about the lives of these Ryazaners. “of inexpensive, practical fabrics in dark tones – broadcloth, wool. The summer suit was made of silk, cotton linen or duck, the edges trimmed with lace braid. 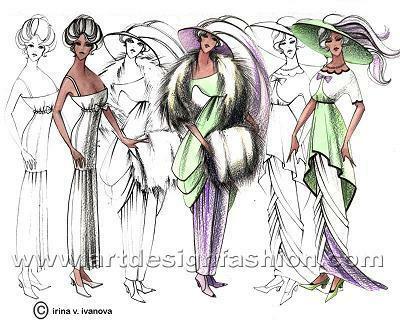 Women of the intelligentsia and emancipated Ryazan women preferred dressing in these suits. 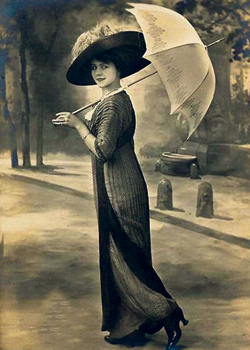 “In the first decade of the 20th century, a third element of the suit began to be sold: the blouse, which had to be lighter than the skirt and trimmed with lace. “The suits of women who came from the villages to work in production were called ‘parochki:’ a fitted women’s jacket and flared skirt of the same fabric. It combined the traditions of Russian folk costumes and European city fashion. On the bodice of the jacket there was usually a lace insert. So the clientele of Madame Gelyassen’s ready-to-wear shop appears to have been both educated women and rural women who came into the city to work in some kind of production. 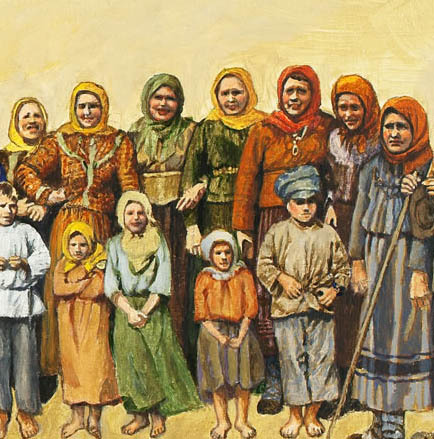 In fact, the description of “parochki” worn by the latter sounds very close to women in a painting I just finished of Russian peasants. To the right is a detail of my painting, which is based on old Russian photos from the time period. The entire painting can be seen here. It seems very possible that Madame Gelyassen’s was the ready-to-wear shop where the brothers Kull worked. I would love to know stories of their interactions with customers of various backgrounds who came into the shop looking for one of the versions of these suits. What were the daily dramas of the Kull brothers’ lives in the ready-to-wear shop? “The girls stood in a queue for [the new Art Nouveau styles] at Wulfson’s – the German tailor, whose atelier was located on Seminary Street…. A month or two before each ball at the Noblemen’s Assembly Hall, the number of orders at the couturier’s increased significantly. The atelier sewed 20 dresses a month, and up to 30 ready-made dresses, brought from Moscow, taken in and adjusted to the figures of the capricious Ryazan ladies. For the “puffy” [presumably fatter] ladies, Wulfson made a special insert…. Will the real Ryazan ready-to-wear shop please stand up? I would love to find a photo of a ready-to-wear clothing shop in Ryazan – above all the one where the Kull brothers worked. Photos of the shop would set the scene for us to envision the Kull brothers’ daily-life stories. But the closest I’ve come after a week of searching has been photos of three ready-to-wear shops in other Russian cities at the beginning of the 20th century. I’ve been wondering and debating with myself which of the three might have been more like our Ryazan shop. Which would be closest to the setting in which Yakov and Ber lived out their everyday comedies and tragedies? 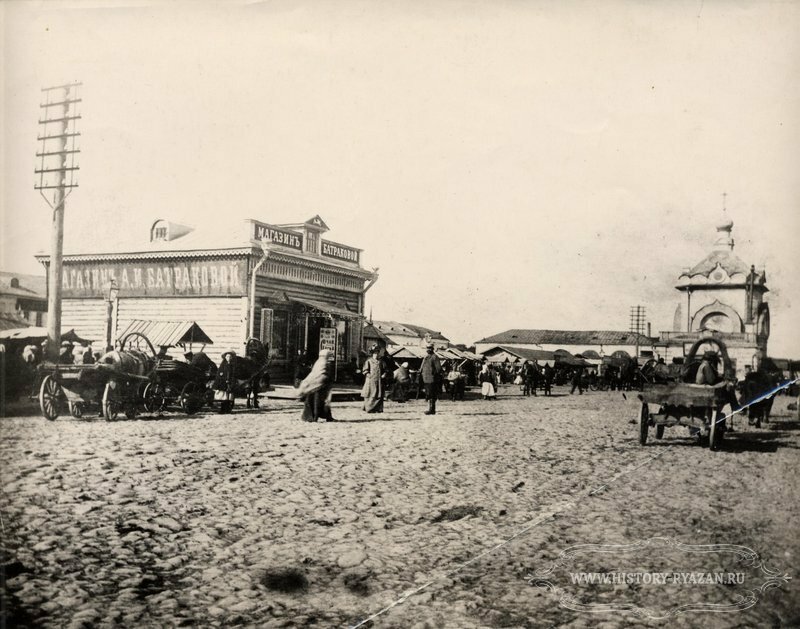 The first photo is of an elegant-looking shop (left side of photo above) in the far northern city of Arkhangelsk, on the White Sea along Russia’s long arctic coast. This photo could easily be mistaken for one of the very upscale streets in Ryazan. Notice the fancy awnings at the windows in the Arkhangelsk shop. The structures on the sidewalks are electric poles of the same type seen on some Ryazan streets as well (see Ryazan photo below). Which of these three ready-to-wear shops most closely resembled the one where the Kull brothers worked? The elegant stone building in Arkhangelsk? The freestanding wooden building in Perm? Or the Novosibirsk shop with its unusal Art Nouveau signage? At this point I can’t say for sure. I can only continue following clues which will hopefully bring us closer, not farther away, from history’s truth. One clue we can pursue is location. 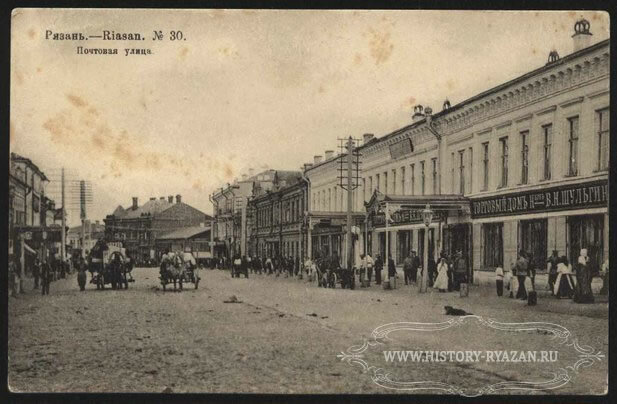 According to the article quoted above, both Wulfson’s couture atelier and Mme Gelyassen’s ready-to-wear shop were on Seminary Street, in the northwest quadrant of the city of Ryazan. I don’t have a photo of any obvious shopping areas on Seminary Street. There were both stone and wooden houses along this street, possibly fitting any of the three photos above. This description of Cathedral Street sounds more like one of the first two photos. So perhaps we should envision the Kull brothers ensconced there. (For a photo of another of the three trendy streets listed here, see the the photo of Postal Street above.) Since both educated women and newly-arrived rural girls were listed among Mme Gelyassen’s customers, we would have to imagine that only the most successful of these new immigrants to the city would have been able to afford to shop on this fashionable street. Perhaps less-affluent people, including those just arriving from the countryside, bought their ready-to-wear clothing in New Bazaar, while hoping to eventually make enough money to shift to shopping on trendier streets. And perhaps at some point in the future, we will discover which type was where the Kull brothers worked. New Bazaar Square in Ryazan. Note trading stalls toward the back of the square. This is Chapter 3 in my series “The World of Jews in Ryazan: Beyond the Pale.” The introductory post about my grandfather is here. For years my grandfather’s life in Russia was a huge unknown to me. The one bit of information I had was that Boris Bobroff had worked “as an engineer” in a factory in Ryazan before coming to the US in 1905 at the age of 22. The factory, like everything about my grandfather’s life in Russia, felt romantically mysterious to me. But when my mother, Polly Bobroff, and I finally discovered the factory’s name, it turned out to be a completely unromantic mouthful: the Joint Stock Company of the Ryazan Agricultural Machinery and Railroad Equipment Factory. It was founded by Yekhiel Levontin in 1904. Beyond that, we knew absolutely nothing, and couldn’t imagine what Boris Bobroff’s life might have been like in this small city southeast of Moscow. For years, my endless online searching turned up absolutely nothing about the factory or about my grandfather anywhere in Russia. So it’s been with a profound sense of awe that I’ve begun to find bits of information about Levontin’s factory, and so to envision something of what my grandfather might have experienced there. One key to my search success was online tools that made it possible for me to use my now-rusty Russian reading skills to search Russian language websites. One very important resource in my search has been the website of Ryazan province in Russia. To my utter amazement, this Russian language website has a photograph of Levontin’s factory. The photo is dated 1916, over a decade after my grandfather left Russia. The factory had grown in the intervening years, so it would have been somewhat different when he worked there. Still, it was eerie to see a photograph of this place which until now had been like a ghost to me. Suddenly the place where my grandfather worked over a century ago in Russia began to shimmer into focus. In the photo, a man in a typical Russian belted shirt leans against the factory. A horse-drawn carriage harnass includes the traditional Russian bell-shaped shaft bow. 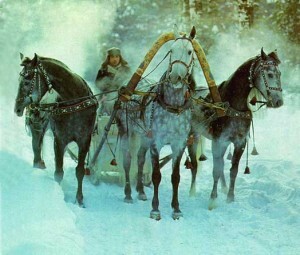 (This type of shaft bow was also used to harness troika-pulled sleighs, see photo above.) It all felt very evocative to me. Aha, some new information: according to this caption, the factory was located on Seminary Street. 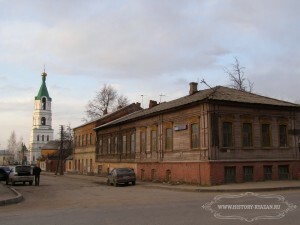 Happily, a search through the massive Ryazan website revealed several photos of that street. Like most of Ryazan’s thoroughfares, it was straight. Like many, it was wide. It appears to stretch off into the steppe beyond the city. A present-day photo of Seminary Street (below) gives a wonderful sense of the kind of wooden buildings that originally housed Levontin’s factory. Parenthetically, it also shows a wood shingle roof, perhaps of the type made by Avrom Mesigal, who I’ve followed in other posts, here and here. “The history of the factory began in 1904, when the businessman Yekhiel Levontin bought two wooden houses on Malomeshchanskaia Street from the Ryazan merchants Kasin and Kolesnikova. He [Levontin] lured six highly skilled workers, headed by the expert master Rudakov, from the Telepnev Factory. He equipped six work places [in his new factory] with a manual lathe, a forge with manual bellows, and fourteen-[horse? ]power diesel. Russian peasant plowing fields. 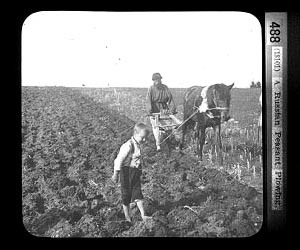 Use of hand plows continued well into the 20th century in Russia. In trying to envision Boris’s daily routines, I tend to seize on small details in the fragments I find. For example, from the description above, it sounds like a lot of the work was originally done by hand using the manual lathe and forge with hand-operated bellows, though part of the work was apparently powered by diesel. I wonder what aspect of this manufacturing process Boris Bobroff presumably helped to work out, given that he was doing engineering work. According to another source, Levontin’s factory produced 82% of the harrows in European Russia, as well as single-plowshare plows and horse-drawn planters. 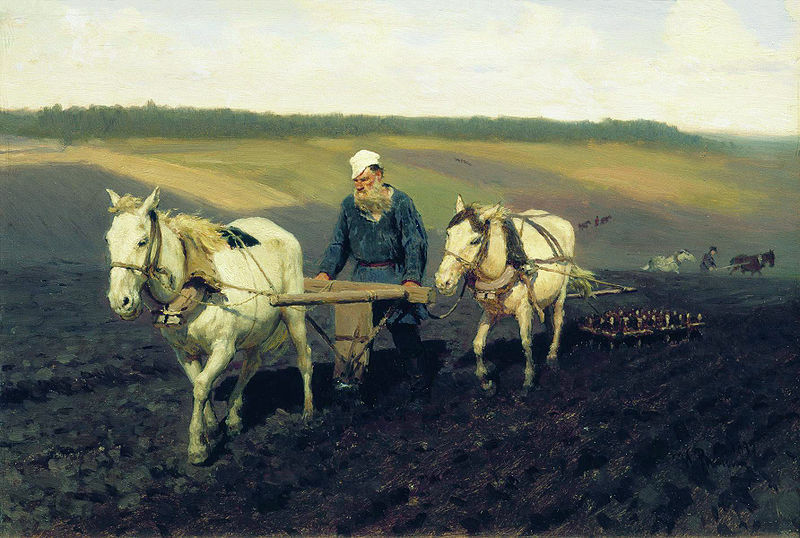 The Russian-style plow and harrow can be seen in the painting below. Another source says that the railroad items manufactured at the factory were switches and crossings. This painting by Ilya Repin shows the Russian plow and, in back of the 2nd horse, the harrow. Both types of equipment were made at Levontin's factory. Which of these items did Bobroff work on? I hope I can find descriptions someday. I do know that, later on in the US, Bobroff received a number of patents on his designs for switches for his automobile directional signals. But I don’t know whether work on presumably much larger-scale railroad switches might have inspired his smaller patented versions. 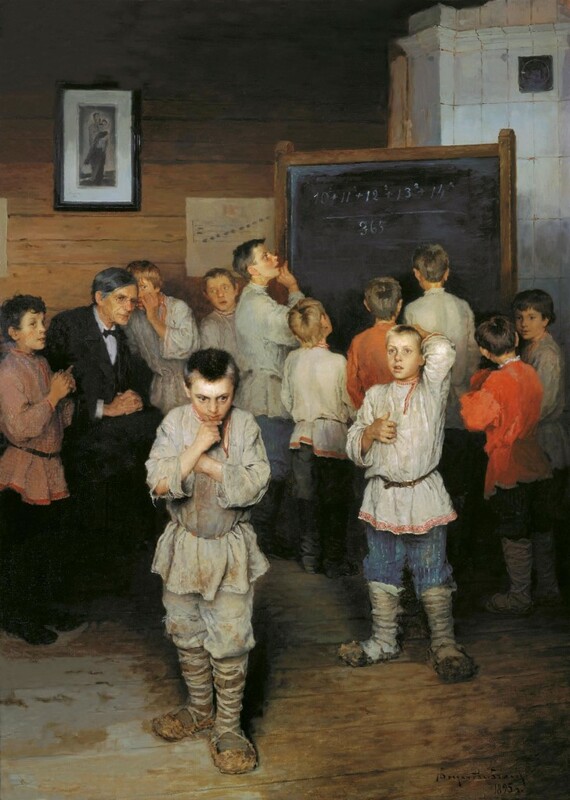 A lovely last description of the inside of the factory in 1914 comes from a rural teacher who brought his students – girls and boys – into the city of Ryazan on a field trip from some distance away. The students had taken advantage of the government allowance to school children of a free train fare each year for field trips. They visited the Ryazan Provincial Museum, and were particularly interested (according to their teacher at any rate), by the agricultural exhibit section. A visit to the handicraft museum and later to the local cinema were followed by free tea and biscuits. The next day, the students visited the printing press of Ryazan Life, a local newspaper. 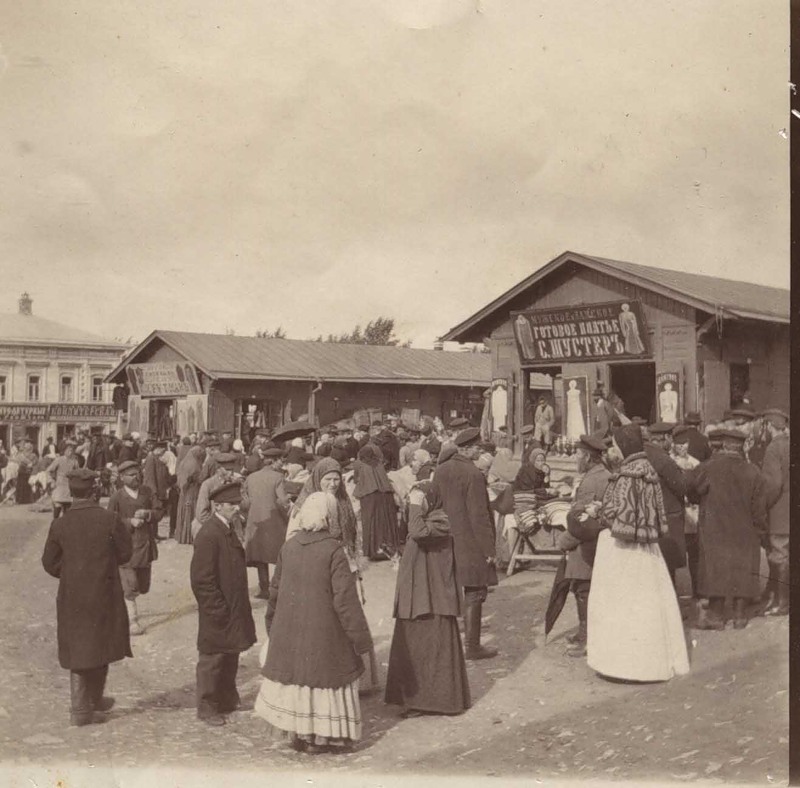 Last, the rural students trooped to Levontin’s factory, where they were welcomed and provided with two tour guides. The students were amazed at what they saw. I can envision these children, who until now had only seen the plows and harrows in use in the countryside where they lived. Now for the first time, they were seeing how the implements were made in the far-off city. On the train home, the children talked excitedly about what they had seen in the city. According to the author of this article,the boys most of all liked the cinema and the agricultural machinery factory, while the girls had other favorites. Surely these kids were too excited by all the startling new sights they had seen at Levontin’s factory to think about its owner being Jewish – if anyone had even mentioned it to them. But I wonder whether, as they became adults, they looked back on their vivid memories of the trip and associated the factory with the ingenuity of its Jewish founder. How did they put their childhood impressions together with anti-Semitic views they may also have heard around them? Again, this description of Levontin’s factory comes from a time after my grandfather had left, when it had experienced rapid growth. I hope at some point to find similar descriptions of what it was like when he worked there. Chapter 1 of The world of Jews in Ryazan: Beyond the Pale, is here. A skilled shingle-maker. A soldier. A dress shop assistant. A 21-year-old engineeer at a Ryazan factory (my own grandfather). These were all Jewish Ryazan-dwellers, and I explore their lives in these blog posts. They were each ancestors of present-day Ryazan JewishGen participants now seeking information about them. Another family in this group of 19th-20th century Ryazan Jews included some of the wealthiest, most influential magnates in Russia. These were the Polyakov family, one of whom was among the very few Jewish Russians permitted into the top ranks of the hereditary nobility. This generation of the Polyakov family included the spectacularly prominent trio of brothers: Samuel, Yakov, and Lazar. Efraim Polyakov, probably the son of one of these brothers, founded an agricultural equipment factory in Ryazan in the late 1880s. Efraim’s great-granddaughter (a fellow Ryazan JewishGener) and I had initially hoped to find that my grandfather, Boris Bobroff, had worked for him. It would have been a fun connection between us. Having done further research, though, I’ve since discovered my grandfather worked at another similar factory at a later time. But there may possibly have been a connection between the two factories through the aforementioned very powerful generation of Polyakovs. The three legendary Polyakov brothers, Samuel, Yakov, and Lazar, had grown up in the Pale of Jewish Settlement. But each overcame tsarist restrictions applied to most Jews and moved eastward out of the Pale. In particular, Ryazan became one of the first stepping stones in the dazzling rise of Lazar Polyakov. Lazar’s brilliant older brother Samuel (left) had become one of the primary builders of railroads in Russia during the era of explosive railway development in the 2nd half of the 19th century. Lazar first became active in Ryazan in the 1860s. Having decided to move into the timber industry, he found partners among Ryazan’s timber merchants. He also became involved in Ryazan’s charitable institutions, in particular the orphanage. This, notes the Russian Jewish Resource website, helped him win the favor of the Empress, who highly valued charitable activity. That in turn advanced his application for awards and titles (note the medals in his photo above). 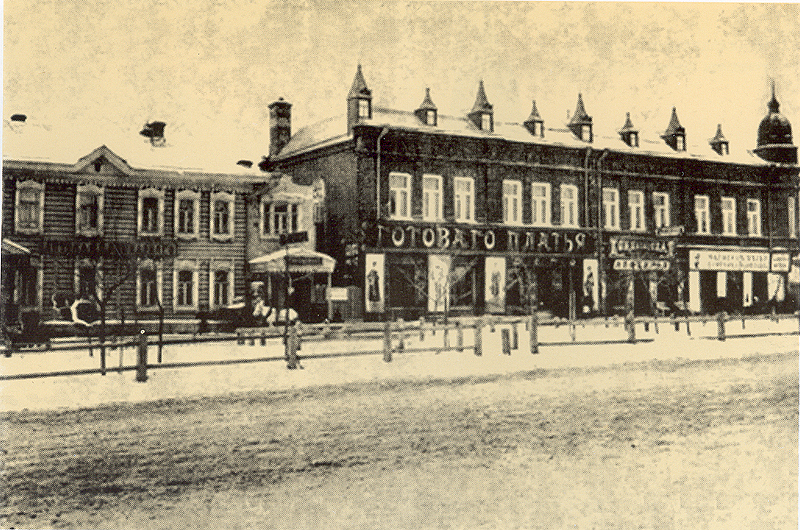 Between 1870 and 1873, Lazar Polyakov founded three banks, in Ryazan, Moscow, and Orel. To the left is a photo of Polyakov’s Ryazan Commercial Bank on Astrakhanskaya Street in Ryazan. Some of the complex history of this bank and its somewhat incestuous relationship – legal under Russian law at the time – with the Government Bank of Ryazan is told on several Russian language websites, including here and here. 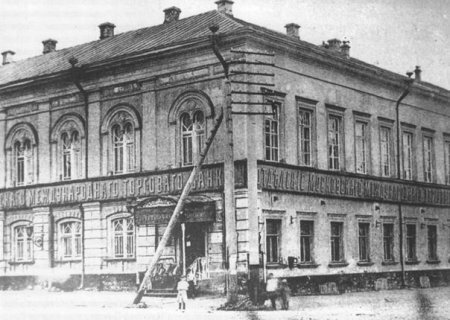 As Lazar’s fabulous ascent continued, in 1891 this Ryazan bank became one branch of his Moscow International Commercial Bank, the largest commercial bank in Moscow by the beginning of the 20th century. 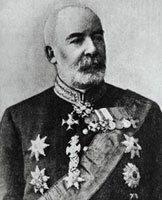 Lazar became active in international affairs, and a member of the Tsar’s Privy Council. Location of Lazar Polyakov's bank, Astrakhanskaya Street. In this view, another bank, the Nobles and Peasants Bank is on right. How might this bank, with its nationally-honored Jewish owner, have affected the world of our little band of Ryazan JewishGen ancestors: the shingle-maker, the soldier, the dress shop assistant, and the young factory engineer? Would their employers have transacted banking affairs there? Might dress shop assistant Yakov Kull have deposited receipts there? Our shingle-maker, Avrom Mesigal, lived in a village near Ryazan beginning around 1875, under the protection of a well-to-do non-Jewish dairy owner. We don’t know how often Mesigal or his family came into the city of Ryazan, or whether his protector might have had banking business there. 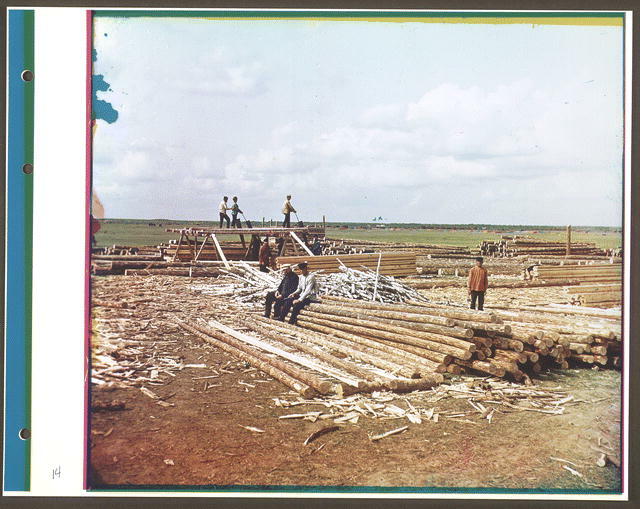 But like Lazar Polyakov, Mesigal was also involved in buying up timber around Ryazan in the 1870s. Mesigal and his protector would buy up a forest, cut down the trees, dry the wood, and craft hand-made shingles from it. Mesigal prospered in this business, living in a large house with his family of seven children. It’s interesting to wonder what Mesigal’s awareness and opinion of Polyakov’s timber business would have been. Psychologically, how might the fame and success of the Jewish owner of their local bank have impacted members of Ryazan’s Jewish community? Would it have made them feel they, too, might overcome at least some of the anti-Semitic restrictions in their lives? According to one assessment today, it’s hard for us now to conceive of how widely-known and discussed the Polyakovs were during their lifetimes, in particular Lazar. Polyakov is also generally believed to have been the inspiration for Bolgarinov, a character in Tolstoy’s Anna Karenina to whom Anna’s brother Oblonsky, an impoverished aristocrat, had to go for help after selling off most of his estate. If Russian Jewish youth today are still racing to follow the footsteps of Polyakov, we can only imagine that Jews of his time were equally fascinated. So the government restructured Polyakov’s banks. Although he lost much of his fortune, he apparently continued to live a lavish lifestyle. (Does all this sound very familiar?) 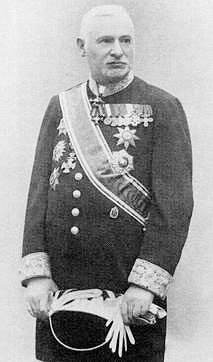 He was awarded the highly coveted title of Baron at the end of his life, and died in 1914. 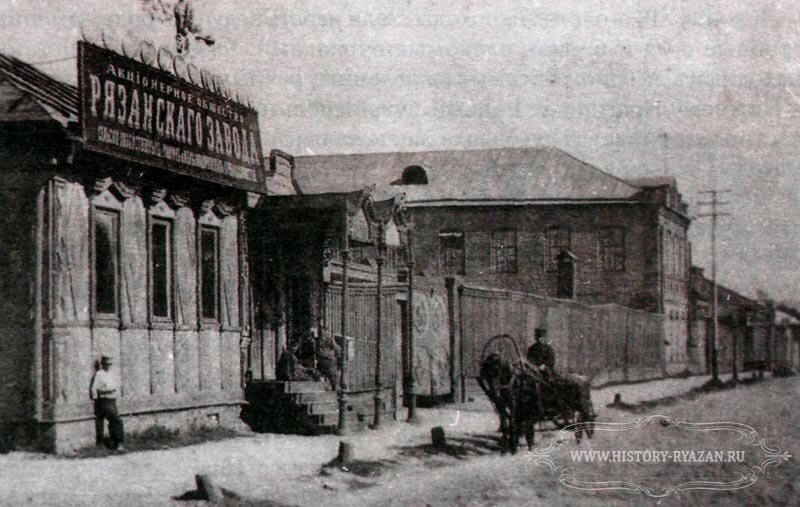 The Joint Stock Company of the Ryazan Agricultural Machinery Factory, according to a Russian language website of essays about banking, was founded in 1889 “with the assistance of” Lazar Polyakov. The factory was hit hard by the banking crisis – perhaps in a way analogous to US employers during our banking calamity today. 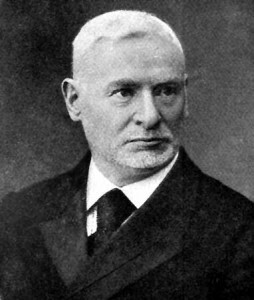 By 1904, Lazar Polyakov had designated a new factory administration (whether this affected Efraim, the article doesn’t say). This new factory administration was unsuccessful in righting the situation. They finally recommended the factory be closed. It’s a shame that – at least thus far in my search – the historical record seems to describe only the misfortunes of this factory, not the heyday it must have enjoyed for fifteen years before that. I will continue my hunt for more information about happier days at the Joint Stock Company of the Ryazan Agricultural Machinery Factory. Meanwhile, a couple of small details about Efraim Polyakov’s factory really caught my eye. Its name was almost identical to that of Yekhiel Levontin’s factory, where my grandfather worked: The Joint Stock Company of the Ryazan Agricultural Machinery and Railroad Equipment Factory. And it was founded in 1904-5, at the same time Polyakov was trying to rescue his family’s factory. It’s certainly possible that two factories in the same small city had nearly the same name. But it makes me wonder whether there might have been some connection or other between the two factories, especially because one was founded at the same time the other one was going under. Is it possible that Lazar Polyakov might have backed Levontin’s factory, hedging his bets? The new factory was small, occupying two already-existing wooden buildings and employing only six people. Presumably it wouldn’t have taken much capital to start up (it eventually became much larger, and exists to this day). Was Polyakov seeking to shift the name to a new entity? Branching out into railway equipment for greater business stability? On the other hand, if there was no such connection of Polyakov to the new factory, were Levontin and his backers poaching on the former glory of all things Polyakov? Did they give their factory nearly the same name in hopes of achieving similar glory? This is all utter speculation on my part, and I am no business whiz. But it’s this kind of speculation and curiosity that fuels my relentless detective work. I’ll be exploring all possibilities in my research to come. A final note: Lazar Polyakov’s success of course by no means erased anti-Semitism in Russia. Anti-Semitism certainly affected Polyakov himself. For example, soon after he had finally managed to build a synagogue in Moscow, following a long struggle for permission, the government suddenly adopted a policy of expelling thousands of Jews from Moscow. 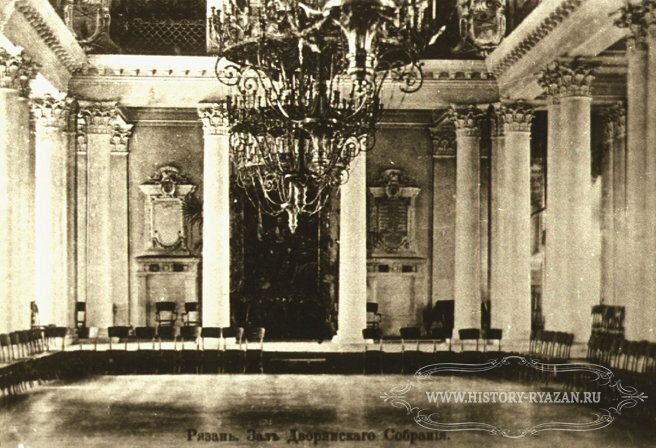 The synagogue was unable to be used for many years. It should also be noted that the honor of being the basis for a Tolstoy character, Bolgarinov, in Anna Karenina is grossly tainted by the fact that the emotional impact of this episode in the book depends on deeply-ingrained Russian anti-Semitism. The embarrassment of Oblonsky’s financial difficulty is intensified by the fact that he must turn for help to a Jewish banker. Bolgarinov makes Oblonsky wait for a long time before meeting with him. “He, Prince Oblonsky, a descendant of Rurik, was waiting two hours in a Jew’s waiting room….” Oblonsky tries to make up puns relating to “the Jew” in an effort to dispel his discomfort at this supposed indignity.